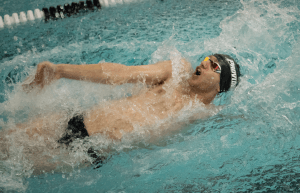 The Providence College Men’s and Women’s Swimming and Diving Teams are making waves in competition this season. The teams are in the midst of their seasons, working towards the Big East Swimming & Diving Championships Feb. 20-23. On Nov. 16-18 the Friars traveled to Kingston, Rhode Island to participate in the Harold Anderson Invitational. The competition was hosted by the University of Rhode Island at the Tootell Aquatic Center. The women secured third place, and the men took home first. The weekend also brought a personal record for a swimmer on the men’s team. Justin Viotto ’22, had a record-setting performance in the 200-yard butterfly and the 400-yard IM. His performance in the 200-yard butterfly earned him a 1:50.20 time, beating the school record previously set by Sebastian Melendez ’21 in 2018. Viotto also topped the previous school record for the 400-yard IM with a time of 4:00.70. The previous IM record was held by John Fatigati ’15, earned in 2014. The women proved to be competitive in the Invitational as well. Lauren Zawacki ’21 earned a second place finish in the 100-yard freestyle with a 52.91 finish. Madeline Snow ’19, earned a second place finish in the 200-yard butterfly with a 2:07.26 time. Zawacki also took home third place in the 50-yard freestyle with a time of 24.28. The success of the Lady Friars was also propelled by a first place relay finish. The 200-yard freestyle relay consisting of Jennifer Bankes ’22, Katie Thornton ’21, Margie Keennan ’21, and Zawacki topped the other relays with a time of 1:36.73. The 800-yard freestyle relay win also contributed to the success of the Friars during the Invitational. Keennan, Zawacki, Thornton, and Snow earned an impressive 7:47.93. Following his performance during the Invitational, Viotto was named to the Big East Weekly Honor Roll. The freshman received the award on Nov. 21. His record breaking performances and consistency in competition earned him this award. Star breaststroker Ryan Trammell ’19 is competing at the Winter National Championships on Nov. 30 in Greensboro, North Carolina. The meet is hosted by USA Swimming and is held in a long course pool to allow for swimmers to compete for 2020 Olympic Trial cuts. Following this meet, the Friars will take a break from competing until Jan. 2 when the men return to face Brown University. The Friars will then head to their winter training trip in Ponce, Puerto Rico.